The initial release of the VCS cost $199 and included a console unit, two joysticks, a single pair of paddles, and the Combat cartridge, which contained a series of tank and plane shoot ‘em-ups. The technology that powered the VCS was cutting-edge at the time, and included an 8-bit microprocessor, 128-bytes of RAM, and a custom graphics/sound chip that supported up to a 128-color palette (depending on the format of your TV signal). At the time, programmers were able to tap into 4K of ROM when developing cartridges. And what about those game cartridges! IAtari initially offered nine games, including Combat, Air-Sea Battle, Basic Math, Blackjack, Indy 500, Star Ship, Street Racer, Surround, and Video Olympics. Many of the games were loosely based on popular games in arcades of the day, a trend the company would continue to mine in future years. 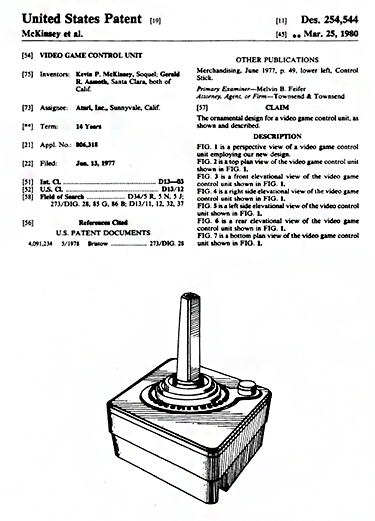 A look at two of the primary design patents for the Atari VCS shows the iconic design of the first console, known as the “Heavy Sixer” to collectors, and the standard joystick. As the Atari VCS continued to grow in popularity and sales, the company continued to expand the cartridge library. In 1980 the company hit the jackpot with the release of Space Invaders, the first-ever arcade-to-home video game license. The home release of Asteroids soon followed, propelling the console to even greater sales success. Third-party software developers also began to get into the act. Two of the most notable, Activision and iMagic, weathered various legal maneuvers by Atari to produce game cartridges that, in many cases, were better than what Atari was building at the time, including Pitfall!, River Raid, Robot Tank, Atlantis, and Demon Attack. Competing consoles also began to appear on the market, including Mattel’s Intellivision (1979) and Coleco Industries’ ColecoVision (1982). These consoles were technically superior to the Atari VCS, forcing the company to counter by releasing the Atari 5200 in 1982. Atari reduced the price of its original console and renamed it Atari 2600, and offered the 5200 as a higher-end gaming option. Due in part to a glut of games on the market (many hastily produced and poorly designed) and a wide variety of competing consoles, in 1983 the video game market was hit with a massive recession, known as the “Video Game Crash of 1983.” Sales plummeted across the board, forcing many companies to declare bankruptcy. During this time, the Atari 2600 – now six year old – began to show its age, especially when compared to more powerful home computers that were being released from vendors like Radio Shack, Commodore International, and Texas Instruments. Atari exacerbated the deteriorating sales situation with the release of two high-profile titles, Pac-Man, and E.T. the Extra-Terrestrial – both of which were savaged by critics. The later title became infamous for having its excess inventory of millions of cartridges buried in a landfill in New Mexico. Another round of price cutting, coupled with a repackaged release of the original Atari 2600 as the Atari 2600 Jr at a piece point of less than $50, allowed the venerable console to hang on until 1987, when it was finally put out to pasture. 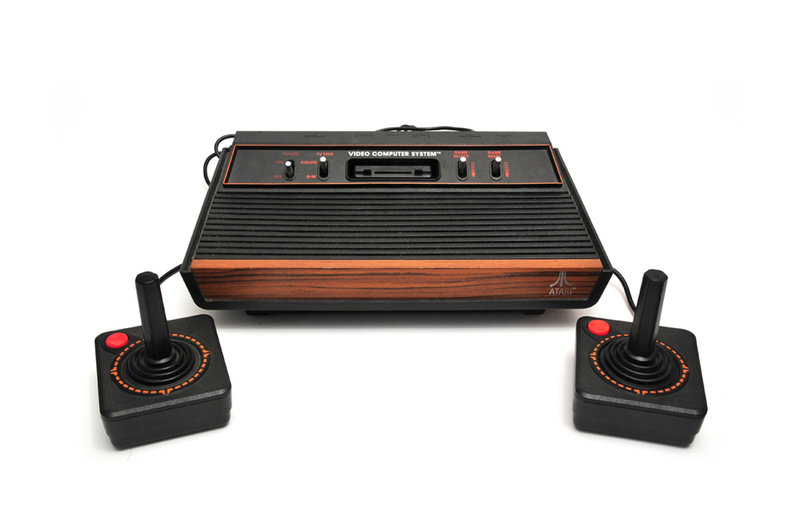 All told, the Atari system enjoyed an unheard of 10-year run. Over 35 years old and with 30 million consoles sold, the cartridge-based Atari VCS continues to enjoy a loyal fan base thanks to the popularity of “retrogaming”, online forums, websites, books dedicated to the game, and even new fan-developed games. On a personal note, the 2600 also represents the first (and only) video game system that I have owned and still enjoy to this day. 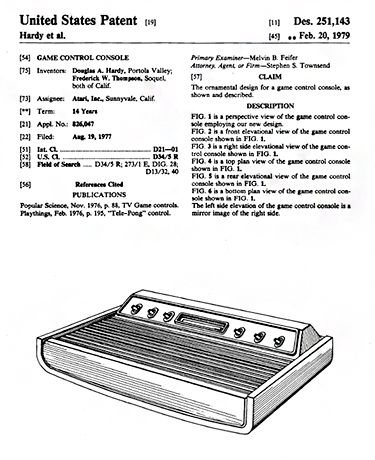 In recognition of its industry-changing status, the Atari 2600 Game System was inducted into the National Toy Hall of Fame in 2007. At this year’s New York Toy Fair, Mattel announced the Fall release of the View-Master Viewer DLX, the latest virtual reality (VR) update for the toy. Over the course of 45+ years, Lite-Brite has undergone a high-tech makeover, replacing the incandescent light bulb with LEDs that are powered by batteries.